horrible movie...waste of a good performance by swank. this movie was beyond boring and poorly crafted. A waste of a strong performance by Swank, and Gere. A complete mess of a film. I agree with previous reviews in that the movie is slow, but I didn't find it "painfully slow". Amelia was certainly a woman ahead of her time and I didn't understand the impact she had on aviation. Good performances (not Oscar worthy). 3 stars. Swank was an excellent "Amelia". Although, slow, the movie was deliberate, as was the title character. Richard Geer was eye-candy as Earheart's devoted husband and eventual publisher. I felt we got to know abit about Earheart. Her determination and free-spirit shone through. The ending was a bit abrupt but so was Earheart's life so there wasn't much choice there. It was so much fun sitting there counting the cliches! Hilary Swank's performance was outstanding! Very definately a must see. When the movie was over, one felt they had spent an enjoyable evening. I had read some reviews prior to seeing the movie so I was actually expecting the worst. Yes, it was a bit slow. I felt that we didn't really get to know Amelia. The richness of her life wasn't showcased in the movie. 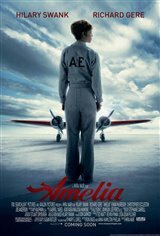 Hilary Swank did a good job but having seen her in previous movies I felt she was short changed because she could have done a excellent job portraying Amelia.